One of the most common topics we get asked is how to lay the perfect shed concrete slab for your new shed. When building any kind of steel shed, the strongest and most durable flooring is the trusty concrete slab. But when it comes to laying your slab, it’s important to get it right. If you don’t know what you’re doing, you’re likely to waste a lot of time and money, and create headaches. So with this guide, it is my intention to provide you everything you need to get the right shed concrete slab in place. Don’t lay your concrete slab in advance! Before even thinking about forming or pouring your slab, we STRONGLY recommend that you finalise your shed design first. Don’t assume, “I know what I want, so what’s the harm in laying the slab now?”. Sheds designs that are still in the planning stage are much more flexible than concrete slabs that are already in the ground! And your concrete slab will have to match the engineering of your shed. Every brand of shed uses a different engineered design for footings, edge beams and other components. So unless you have a finalised design, these will never be in the right place. and if it turns out you have the wrong sort of slab for you shed, with the wrong thickness or dimensions, then it can cause problems you just don’t need. So if you haven’t already done so – don’t lay your concrete slab until you’ve finalised your whole shed design. (If you’d like help with that, contact us for a Free Shed Design & Quote). The right dimensions for your slab are critical. Your slab can be as small as the shed that’s going to sit on it. With the sheds we make at Designer Sheds, the minimum slab size is usually 2m x 2m (there may be some that are a little smaller… contact us if you have a smaller requirement). Again, a big shed needs a big slab. For example, our biggest shed has a 24m span and can be as long as you like. While many shed manufacturers may claim their sheds are a certain size, some shed companies use nominal sizing – which is another word for approximate sizing. We once came across a national chain that referred to one of their sheds as a 9m x 6m shed. But when we got out the tape measure, the actual size was just over 8.4 metres by 5.9 metres. So you wouldn’t want to lay a 9m x 6m concrete slab and then find out that it was the wrong size! With our sheds, your actual shed size will exactly match the slab size you require. That being said, where practical, there can be efficiencies from matching your shed size to the standard dimensions of steel sheets. So again – it is important to settle on your shed design first, before thinking about slabs. The right concrete slab thickness is critical. A thin, brittle slab will crack under the weight of the shed and what you put in it. And an overly thick slab will cost more than it needs to and be more difficult to put in. The minimum concrete slab thickness we recommend is 100mm. This will be adequate for light / normal use – such as parking cars or caravans, as well as storing workshop equipment and the like. However, if your application is heavier (such as storing heavy machinery or heavy vehicles in your shed), then a greater thickness is required and/or additional steel reinforcement. If you speak with your shed consultant, they will help with some advice on the correct thickness for your application. One thing you must consider is if the soils in your area are reactive or not. A reactive soil will expand when wet and shrink when dry, causing movement in the ground. The different classifications are listed below. If you have a soil type H, E or P, you would probably already know about it. The further down this list you go, the more likely the soil is to be “reactive”. Special building techniques apply to reactive soils. As you can imagine, shifting soils will cause serious damage to the slab and building if not done correctly. The potential problem only gets worse after you have laid your slab. This is because with a lot of rain, the soil around the slab gets wet and expands, while the soil under the slab stays dry and doesn’t expand. If you are in an area that has reactive soil, it’s easy to engage a soil testing service to test. You can send your soil test report to your shed consultant, and they will get their engineer to advise what, if anything, needs to be done to strengthen the slab to withstand the additional forces. The cost of a soil test usually a few hundred dollars, depending on where you are located. Keep in mind that if there are already other buildings on the property close to where the shed will be built (particularly a house), then a soil report will have already been done, and can be used for your shed. The next thing to do is to find out how level your site is. Over the decades we have had many people tell us their site is “flat”. However, there is a distinct difference between “flat” and “level” (a wall is flat, only vertical). Even an experienced eye can be deceived by variations in falls. Any good concreter these days has a laser level. Their quote should include inspecting and measuring the site to ensure it is accurate. If you want to check the site yourself, the simplest and cheapest way (if you don’t have access to a telescopic or laser level) is the humble string line level. These start from only few dollars at nearly all hardware stores. Hang one of these over a tight string line to get a quick-and-dirty reading of how level your site is. A string line level clips onto a string line that is pulled tight. Then you fix the high end to a rock or tree, and lift or lower the other end until it shows level. From there you measure from the string line down to the ground in several places. We would not advise constructing formwork with a string level… but if you want to double check the estimates you have, it is more than sufficient. Should you DIY, or hire a professional? Some people wonder if they should lay the concrete slab themselves, or hire a professional. Our advice is: if you’re not a professional concreter, hire a professional concreter. If you’re a very accomplished home handyman or handywoman, you may feel comfortable doing the concreting yourself. Just bear in mind that the quality of your shed will be highly dependent on the quality of your concrete slab. So don’t go into it lightly. There’s a good chance you’ll struggle otherwise, and waste a ton of time and money in the process. It is important to check that any potential concreter has plenty of experience with shed slabs. Shed slabs usually have to be more accurate than slabs for a house, because steel doesn’t bend much if the slab is slightly out of alignment. However, with a house slab that is off-kilter, a bricklayer can do a few tricks to adjust. So, quiz your concreter to see how much experience they have with shed slabs. Also, our advice is not to simply go for the cheapest quote, thinking they are all licensed and know what they are doing. Ensuring your concreter is a member of an industry association such as Master Builders Australia (MBA) or Housing Industry Association (HIA) is a good start. If you do have a dispute down the track, these associations offer quick mediation services, and will de-register any operator performing sub-standard work. As a result, you usually won’t have any problems in the first place. It is best to have your concreter organise and supervise any earthworks. They normally don’t charge for this service, because it saves them a lot of time and effort if the job is done right the first time. We have often had a customer get earthworks done, only to have the concreter turn up and say it hasn’t been done right. This means getting someone back to do it again, costing more time and money. Cutting refers to cutting out material from a slope to create a level surface. And filling is the opposite – adding material to the ground to build up a level surface. With both cutting and filling, you should ensure you also level out at least 1 to 2 metres around the shed edge. This allows easy access to build the shed, and afterwards for maintenance of the shed and ground. Leaving a generous level pad around your shed also prevents erosion, which can undermine your slab foundations. A filled site will also mean any area of the slab not on natural ground will need piers through the fill down to natural ground at a maximum of a 3 metre grid, and under every column. Concrete piers will support your shed in case the fill underneath your slab settles – reducing cracking and movement. Concrete piers ensure your slab and shed are supported on solid ground. In the case of our sheds, all the components are pre-cut to the exact lengths needed. So if the slab is out of level, your shed will be too. For argument’s sake, what would happen if your slab was off-level? Well, you would have to cut the columns shorter if they are on a part of the slab that is higher. However, then the sheeting would overhang the slab a greater distance. Roller doors in this area would then have reduced clearance – so if this is critical to fit a horse float or caravan, for example, then you would have big problems. Also keep in mind that you will be able to see the whole shed floor from any location… so the flatter and more level it is, the better it will look visually. 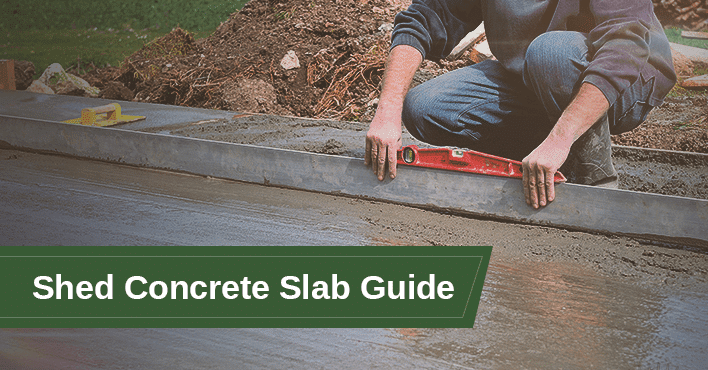 So in summary – make sure your slab is absolutely level! Your slab also needs to be as square as possible. In other words, to have exact right-angle corners. Otherwise, when you get to the roof, your shed builder will have trouble keeping the structure square and aligned. The sheeting will also end up out of square to the rafters and purlins, and “saw toothed” or not aligned in the gutters and the apex… which doesn’t look good. In case you need a refresher on shed jargon, this diagram will help! It’s important to have a signed contract for the work to be performed. The contract must be written either on the industry association’s pro forma contract, or the official contract of the licensing body in your State. No reputable contractor would refuse such a request, because it is just as important for them in getting paid. Also, never pay anything upfront, and have someone check the tolerances before paying after completion. Being perfectly level is a hard one to check without either a telescopic level or laser level. But if you are concerned, it isn’t expensive to hire one or get your shed builder to check it all for you. Your shed erector is the end of the line, and the further out of alignment your slab is is, the harder it is for them. So it is in their best interests for all the levels and sizes to be correct. Measure all four sides of the slab. They should be all as per your shed size. 10 to 15 mm longer or shorter isn’t a real problem.. but anything more than this could be, depending on the size of your shed. Now, look down the four edges to see if they are straight.If you are concerned, pull a string line tight from corner to corner. There should be no more than about 10mm either in or out from the line. Finally, measure diagonally from corner to corner and write down what the measurement is. Then, check the distance between the other two corners. The two measurements should be close to identical. Up to 10 to 20mm for a small slab, and 20 or 30mm difference for a large slab is OK. Anything over that and things start to get difficult to build. The nature of concrete is that it will develop some small cracks over time. To combat this, our engineering specifies saw cuts at regular intervals to help limit visible cracking. Saw cuts in your concrete slab can prevent cracking in other places. The idea of the saw cuts is that hopefully the cracks will occur in the cuts, making them invisible. We also require key or doweled joints on bigger slabs to allow for expansion and contraction. This also reduces the amount and size of cuts required. For larger slabs, doweled joints allow the slab to move slightly, reducing cracks in the process. Don’t let the concreter try and talk you out of the joints or saw cuts: they serve an important purpose. After the slab has cured for a week or so, it’s possible to fill the cuts and joints with an appropriate filler to keep out small stones and gravel. As you can see, building a slab for your shed is all about preparing properly, and having competent people doing the work. You’ll find your shed will be completely transformed by having the perfect concrete floor, but you need to follow the appropriate steps to achieve outstanding results. Now that you know how to create the perfect concrete slab for your shed, you might be looking for the shed itself… and that’s where Designer Sheds can help. 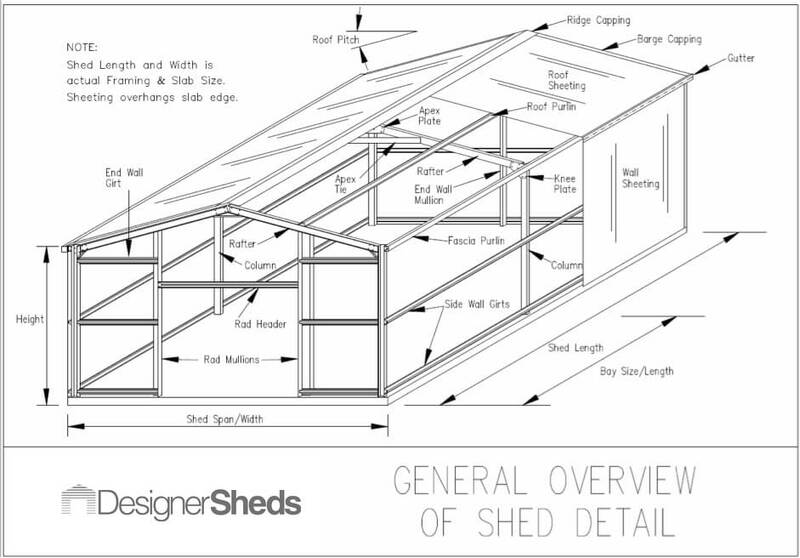 If you want to find out more about the shed design process, feel free to download ourUltimate Shed Design Guide. Or if you’d like some 1-on-1 help, request a free Shed Design & Quote with one of our expert Shedologists. If you have any more questions about sheds or concrete slabs, get in touch and we’ll be happy to help. We also offer a Shed Advice Hotline for customers who are in the process of building their shed, so if your concreter or shed erector has any technical questions, help is just a phone call away. Don’t build any shed, garage, stable, barn or workshop until you’ve downloaded the Ultimate Guide – FREE. Let us help you design your ULTIMATE shed and supply you with the blueprints and a firm quote, free of charge. Ready For The Best Shed Ever? © 2019 Designer Sheds – All rights reserved. You can book a convenient time to chat on the next page. Get Free, Proven Tips To Save Time, Money and Stress When Planning Any Shed Project. This is one of the easiest projects I have been involved with, made all the more easier in that the shed/carports planning was done interactively on-line; no waffle from any sales person, simply matter of fact discussion. Great company to deal with, and the personnel kept me informed throughout. No hiccups, nothing … and by the way a fantastic product.Thanks & cheers. I struggled to find a shed builder that could build the shed that I wanted with my budget as the dimensions are a bit tricky. Then I got in touch with Designer Sheds and not only received a top notch shed designed exactly the way I wanted it but it was far less than the quotes I was receiving from other builders for a custom shed. Keep up the good work fellas! Most shed companies stock a standard range of designs but aren't able to customise a design to suit a specific application. Designer Sheds have a unique engineering approach that allows a customer to customise the dimensions and design of their shed to suit their specific application. Highly recommended. Just got a new shed built for my gardening tools and hubbies car. Gentlemen at designer sheds were very courteous and pleasant to deal with. For a person who doesn't know much about sheds, they made it very easy. They built me a really nice custom shed. Now I've got somewhere to put my V8. Yipppeeee! Thanks Designer Sheds!